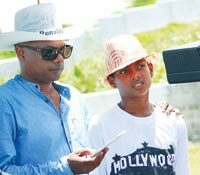 H e was holidaying with his family in Coonor, but the word a�?fathera�� got ace film director and producer Gautham Menona��s attention and we got talking about reel dads and the inspiration behind them. Having created the concept of the a�?coola�� dad in Tamil cinemaa��the one who eggs his son to travel across the world and woo his girl inA�Varanam AaayiramA�or the father figure who dotes on his deceased lovera��s daughter in the recentA�Yennai Arindhala��Menon says he draws inspiration for his characters from his own father. a�?Whenever I have to write a fathera��s character, I pull out a memory of my dad. He was chilled out and a friend to me and my sisters, but also knew when to give us sound advice. He allowed me to pursue anything I likeda��from cricket to films,a�? says the director, who wishes fathers were portrayed better in cinema. As lyrics play an important role in his films, Menon says he stands by the song Unakenna Venum Sollu(tell me what you want) from his recent Yennai Arindhal.a�?My cue to Thamarai (the lyricist) was that what is encapsulated in the song is probably what every father would want to tell his son/daughter,a�? says the 42-year-old. Even when parenting his three sons,A� Menon looks to his dad for inspirationa��being a friend to them and identifying their strengths and weaknesses. a�?I tell them that if theya��re scared of something, not to shy away from it butA� face it bravely,a�? he says, adding that his sons they feel they can talk to him about anything. He says parents should let their kids be themselves, to create a space for themselves. a�?Be your kida��s best friend, especially if theya��re daughters because a daughter-father relationship is in a different league altogether,a�? signs off the director, who has just finished shooting the road trip for Simbu-starrer,Acham Yenbathu Madamaiyada. ?A� Mani Ratnama��s Nayakan: a�?What is beautiful is that despite the community thinking of Kamala��s character as a patriarchal figure, his own daughter never accepted him. His love for her went unrequited, which was beautiful and painful,a�? says the director. ?A� Piku: a�?An endearing take on the father-daughter relationship. I think the way she handles her father and his constipation issues is very slice-of-life. These kinds of films make you head home feeling like sharing an equation with your parents.a�? ?A�A� Everybodya��s Fine: a�?Hollywood films portray father figures extremely well. In this film, the fathera�� widowed, chronically-ill mana��embarks on a cross-country trip to spend time with each of his children after they turn down his offer to spend the holidays with him. Ita��s a beautiful portrayal of what life is all about.a�? Menon says his three sonsa��Arya, Dhruva and Adhyaa��will gift him a cricket bat and a CD full of songs. a�?I introduced them to cricket, reading and music. So Ia��m sure their gift will be one of these,a�? he insists.